To me, my mom – my smart, sharp, wonderful, supportive mom – was therefore first and foremost a mother. Any other role she happened to inhabit – worker, wife, daughter, aunt, friend, sister – was incidental, almost like an afterthought meant to amplify her ability to continue to be, in my mind, the best mom in the world. It really wasn’t until grad school, a period when I finally started coming into my own and following some of the paths I had laid out for myself, that I learned the most valuable lesson about her: not only is she more than a supporting actor – she’s a dreamer, a visionary, an enabler, and one heck of a strong woman in her own right. In the grand scheme of things, I’m not surprised it took me so long to realize this. Growing up, I distinctly remember telling my mom that I would one day become a famous actress, to which she replied: “It’s fine to think about – but don’t get your hopes up.” Never one to mince words or sugarcoat the truth, my mom was (and still is) undoubtedly a realist, and this fact made it difficult for me to perceive how, at the core, she was also the greatest dreamer I have ever known. So when I started blogging three years ago, the hobby concerned her: did I have enough time to study? Were there enough hours in the day? Was this an endeavor I meant to take seriously? I think it was only when I fully convinced her of my resolve to take blogging seriously last year that she switched gears (and, as with everything she does, she did it promptly): did I know that she had shared my blog with her coworkers today, and they had loved it? When was I going to bake next? Why didn’t I try working with more companies and networking? Underneath all of these questions, she was asking me one core question, the most important one of all: Was I following my dreams? Reflecting on my mom’s life, as well as all of the circumstances leading up to that fateful moment twenty-odd years ago when she became “my mother,” I suddenly realized how much more I could value and respect her as an individual if I could get over the fact that she was “just” my mom. Yes, we are indelibly connected to one another biologically. But she is so much more than that connection. She is not an amazing person because she is an amazing mother. She is an amazing mother because she is an amazing, incredible, unparalleled person, one who deserves every happiness life has to offer. I think this is something I have struggled to convey to her because, in some ways, I’m not sure I had articulated the thoughts very clearly in my own head up until now. I respect her for her dreams, come true or not; I admire her for her ability to triumph over circumstance, her willingness to find joy vicariously through my successes and keep me grounded at the same time. I appreciate her for her vivacity and unceasing energy, and most of all I love her for her unconditional ability to love. So, if you’re reading this, Mom (and I know you will be! ), know that when I call to say “Happy Mother’s Day!” today,. I mean all of the things that I have not been able to say out loud but have wanted to write here for such a long time. I love you so much! Needless to say, my mom was INSANELY happy when she heard about this latest development, and her reaction just reaffirmed my sense that she has got to be one of the most generous people I have ever known. Who’s the more-than-just-a-mom in your life? Let me know in the comments! 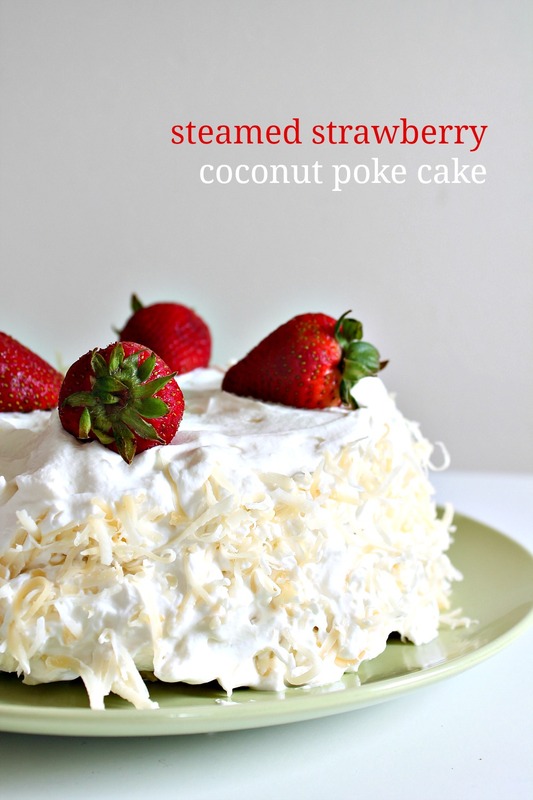 This is a very similar recipe to the steamed strawberry coconut poke cake I entered in this year's California Strawberry Festival. It's an award-winner that doesn't require an oven and that has amazing bright flavors, so DON'T skimp out on this one! Place a steaming rack inside a large (wide) pot and fill pot with water until rack is just covered. Cover pot and place over medium heat on stovetop; allow water to come to a slow boil while you prepare the cake. In a large metal bowl, beat eggs with a hand mixer until quite light (at least 3 minutes), then add sugar and continue beating until very pale and fluffy (another 5-6 minutes). Add baking powder to flour, then gently fold dry ingredients into egg mixture until just incorporated. Pour half of the batter into a 6-inch metal or ceramic (i.e. heat-safe) round tin--be careful not to fill it more than halfway up the sides of your tin, since the steamed cake will rise. Quickly remove steamed cake from pot and poke holes all over it with a chopstick. 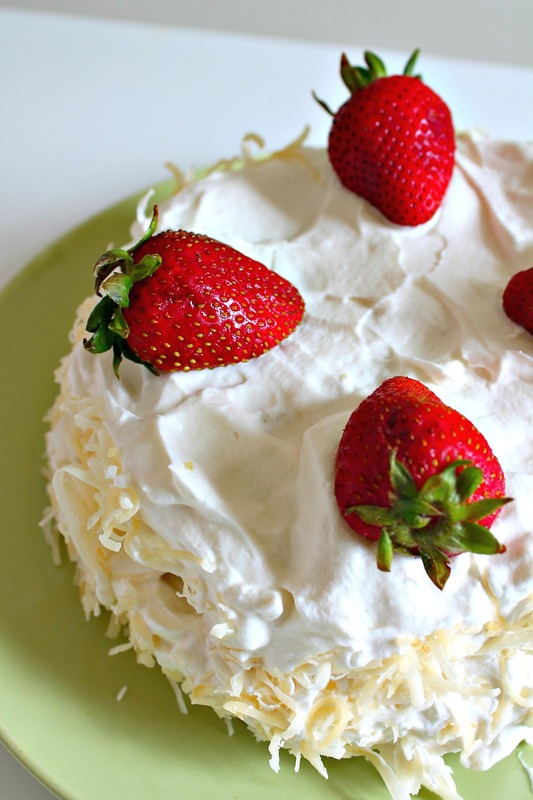 In a separate bowl, combine condensed milk and cream of coconut, then pour this mixture a bit at a time over the poked cake. Use a brush to help the milk mixture soak fully into the cake--you will want to use about 1/3 of the milk mixture for this step. Repeat steaming and soaking process for second cake layer. 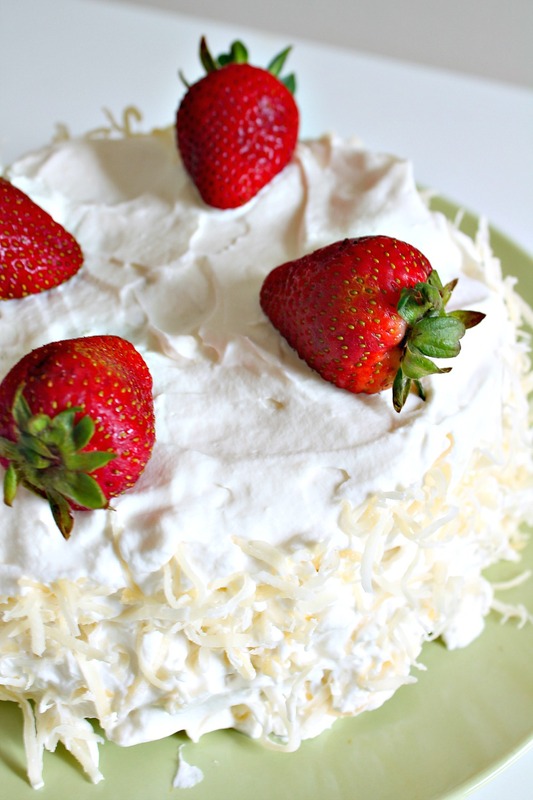 To layer cake: place a soaked cake layer on plate, top with whipped cream, layer with strawberries; repeat the process, then top with toasted coconut if desired. Refrigerate for at least 4 hours before cutting and serving! Looking for more ways to make Mother’s Day an unforgettable occasion? Don’t miss recipes from the rest of the Sunday Supper crew! Steamed cake? I have GOT to try this. I bet it is beyond moist. Renee, it’s out of this world! You’ll love it just as much (if not more than) a baked cake, I guarantee it 🙂 wishing you a lovely week! I think when you’re a kid, it’s so hard to realize that your mom is actually a person and not just a mom..but as you get older it definitely becomes increasingly more apparent…which is kind of the best. Happy mother’s day to your mom! This is a PERFECT cake to celebrate with! Wow, what an awesome looking cake!! I just love it!! Thanks so much, Tara! I hope you’re having a wonderful week! Really nice post for Mother’s Day. Good cake, too. Thanks. What a wonderful post! 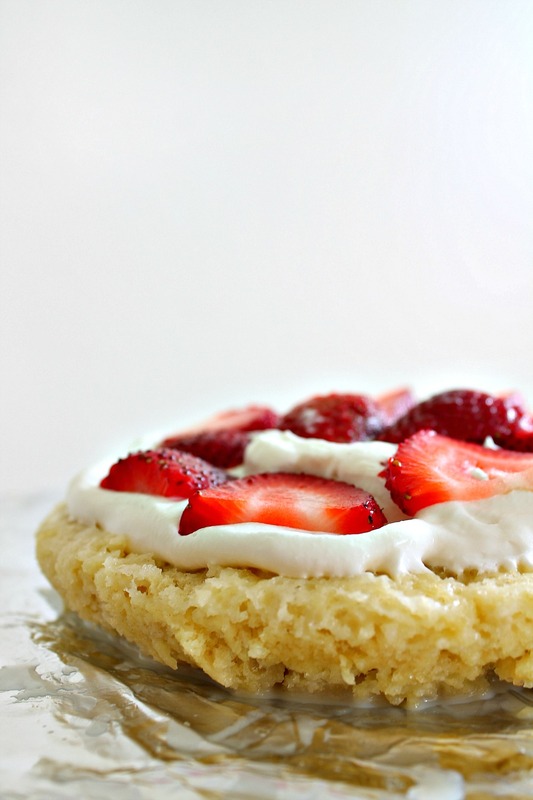 From the thoughts about your mom to the upcoming strawberry festival and fab recipe, I very much enjoyed this post! Thanks so much for the kind words, Deb – as always, your comments mean the world to me. I hope you’re having an absolutely wonderful week! What a beautiful tribute to your mom, Ala. It’s hard to see our mothers as more than that when their being mothers is so integral to our lives, our happiness. I don’t think I really appreciated mine until I got a little older and realized the sacrifices she had made. Congratulations on the baking contest! That steamed poke cake looks incredibly and I am sure you will do well, or, at the very least, make your mom proud. And that’s worth a lot. Stacy, your comment totally resonated with me! Thank you so much for sharing that thoughtful insight – it really is difficult, but the change of perspective makes it all even more worthwhile in the end. Fingers crossed for the weekend, and thanks so much again for your wonderful thought! Omg this was such a sweet post!!! But it’s so true! This cake is amazing. 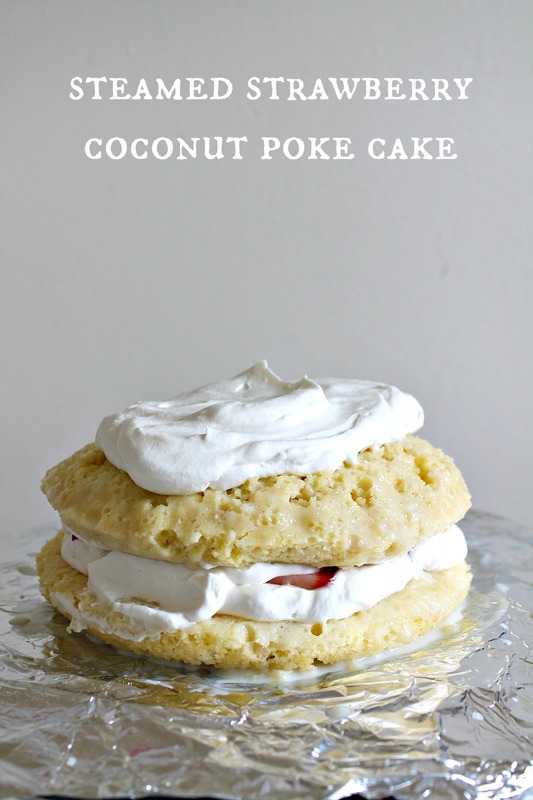 I mean who could go wrong with coconut and strawberries? And steaming??? Thank you so so much, Anne – it really is the truth! You’re absolutely sweet; I hope you’re having a wonderful week! What a lovely tribute to your mom. She sounds like an amazing woman, and one that you’re following in the footsteps of. This recipe is just wonderful. Thanks for sharing all of it! First, good luck, good luck, good luck in the contest! I’m sure you’ll do fab! Now, your post totally made me cry. Sometimes we don’t know really important things about our moms. I’ve kind of forced my mom not to be a realist since being a famous novelist and screenwriter is plan a-z. We’ve actually talked about her dreams quite a bit, and she wasn’t a dreamer at all. But now she’s become one right along with me. It’s pretty cool! Oh wow, Laura – thank you so much for this absolutely moving and thoughtful comment. You’ve totally got this! I’m glad you have the support of an absolutely wonderful mom. I did get your email – I’ll try to dash off a reply in the coming days, but know that I have my fingers crossed for you! Your mom sounds like a gem, Ala! As is this delectable cake! What’s not to love??? Aww, totally – though I might say the same to you, Liz! You’re an amazing woman and mother. Wishing you the best this week! You sound like an equally great daughter too! Your cake looks soooo good! aww you’re way too sweet. Thanks so much for your comment, Cindy–you’re lovely! I think you’ll love it if you ever do get a chance to try it! I hope you had a wonderful weekend as well – and the lovely week ahead, too! Thanks so much, Valerie! <3 that means a lot. Moms are really the best! And it isn’t until we grow up do we really see all their great qualities and values they passed on to us 🙂 This cake = awesome!! Aaw what a sweet tribute to your mom 🙂 She sounds like such an amazing woman! Yay, way to go on the contest, Ala! Good luck next week! Love this steamed cake! It looks incredible! Thanks so much for your sweet words, Kelly – as always, they mean a lot! This looks delicious!! Good luck in the festival! Thank you so much for your well wishes, Shaina! I hope you have a wonderful week! She’s definitely a rare gem, Erin 😉 thanks so much, hope you’re having a fantastic week! Wow, you have such a serious gift for writing…and it sounds like your Mom is one heck of an awesome woman, too! But this cake. Let’s talk about cake. I’ve never heard about a steamed cake, but now I am super intrigued. I’m resisting the urge to run downstairs right now and recreate this cake! But it’s on the list of things to do soon. (Just not during my mandatory staycation…haha!) I hope you did well this past weekend in the contest! Dear, I love my mom. this recipe one of the best gift for me. I will try to do this.